The keynote lineup for the upcoming AMD Developer Summit was announced, and the lineup is nothing short of interesting. The AMD Developer Summit (APU13 in short for this year), is an annual event held by AMD which focuses on the new software development tools and techniques that enable new kinds of software running on AMD APUs. Last year, during AMD Fusion Developer Summit (AFDS12), the HSA Foundation was founded with some of the big names of the computer hardware industry, including AMD, ARM, Imagination Technologies, Samsung, Texas Instruments, MediaTek and Qualcomm later in the year, with an expectation of an estimated of 2.1 billion connected devices by 2016. Previously held in Seattle, Washington during mid-June time frame, this year AMD made an announcement changing the venue and the dates of the event to San Jose, California during November 11-14, 2013. This year, the 3-day event features 14 different tracks, 7 keynotes, demos, over 150 sessions and tutorials. The registration is already open, but this year, there will not be an early bird discount for attendees, however AMD is entering early bird attendees into a drawing for a chance to be part of the exclusive Influencers Insight Program, where participants will be able to have a candid conversation with some of the keynote speakers. On the stage this year, Lisa Su, SVP and GM of Global Business Units, will present the keynote along with Mark Papermaster, SVP and CTO, and Phil Rogers, Corporate Fellow. Featuring AMD’s strategies, technology outlook and updates on the HSA Foundation. On the other hand, three HSA founding members presenting their own keynotes, giving updates of their support on the HSA standard. Speakers include: Mike Muller (CTO, ARM), Tony King-Smith (Vice President of Marketing, Imagination Technologies) and Chienping Lu (Senior Director, MediaTek USA). While Nandini Ramani (Vice President of Development, Oracle Solutions), Johann Anderson (Chief Architect, DICE) and David Helgason (Founder and CEO, Unity Technologies) will also be on stage for their keynote sessions on the software development front. And here, we take the liberty to join some of the dots for you, our readers. The major milestone for the HSA Foundation would be the release of the first official HSA specifications. As the first HSA specification (v0.95) [PDF file] was put online May 29, 2013, with the version 1.0 specification already in the working group for ratification, this is a very likely announcement this year, probably alongside a series of announcements of supporting HSA specifications on current or very near-term hardware from the three HSA Foundation founding members, ARM, Imagination Technologies and MediaTek. These include the Cortex-A50 series (A53/A57), the Mali GPU, the Imagination Technologies PowerVR graphics and their MIPS cores, and smartphone SoCs from MediaTek. For the Oracle keynote, anyone remember the AMD Oracle OpenJDK announcement here? The Project Sumatra has recently hit a milestone with the release of the HSAIL Simulator on the web on July 1, that combines libHSAIL, the tools for parsing, assembling and dissembling HSAIL, the HSAIL instruction set simulator and the Okra interface, described as “a thin Java and C++ layer on top of the simulator which allows creation and dispatching of HSAIL kernels” for a preview on developing Java applications on future HSA-enabled hardware. So it’s a step closer to the official release, and since we would be seeing a HSA standard readily adopted into the mobile space with the push from HSA members, an announcement would seem equally likely. On the mobile space, game development is all the hype recently, with the Unity3D game engine being famous for its cross-platform availability, be it a web game, a PS3/Xbox 360/Wii U/Wii console title, a iOS/Android/Windows Phone/Blackberry game, or even a Windows PC/Linux/Mac OS X game, and a considerably low entrance fee (free for the regular version, and $1500 for the Pro version with advanced features), the HSA support announcement would seem to be a logical move for the company to attract more developers (even for individual/smaller group of game developers) to make successful games like the Temple Run series from Imangi Studios using the engine. This would allow more developers to get more performance out of HSA-enabled devices without the steep learning curve given the familiar development environment. On the PC gaming category, DICE has been the very first developer to make the switch to DirectX 11 technology with Frostbite 2 engine in 2011, abandoning the DirectX 9.x codepath. The game engine also uses DirectCompute extensively for advanced features like tile-based deferred shading and MLAA. With the Frostbite 3 engine (debut with Battlefield 4) targeting next-generation game consoles, namely the PS4 and the Xbox One, and with the similar way the CPU and GPU sharing the unified pool of system memory, supporting existing AMD APU platforms should be a relatively easy task. With the hUMA (Heterogeneous Unified Memory Access) feature available on “Kaveri” APUs, it would be a good time to let game developers to start coding around the feature, optimizing for performance gains, and discuss advanced coding techniques on this HSA-enabled architecture. AMD might also preview a list of upcoming Gaming Evolved titles for the APUs (mainly for “Trinity“, “Richland” and “Kaveri“) and AMD Radeon GPUs. As for AMD, the more exciting stuff would probably be the product launches and any products being shown on stage, or being exhibited around the experience zone. For instance, “Kaveri” is expected to launch in Q4 2013, and thus people would be expecting AMD to talk a little more about it. And with APUs entering the server market, and previous reports about APU-based SeaMicro boards, it’s not unusual to expect AMD to have something ready to give a big push in this market, given both the “Steamroller“/Cortex-A57 cores and “Graphics Core Next” (GCN) GPU are all capable of ECC memory, and have some sneak peeks at the “Berlin” (x86-based) and “Seattle” (ARM-based) APUs. The “Volcanic Islands” family GPUs could also be shown on stage under some disguise if the development goes well, it could be just an executive holding a bare chip, a graphics card or probably just a game demo on stage to show off smooth and fluid gameplay in ultra-high resolutions and image quality. 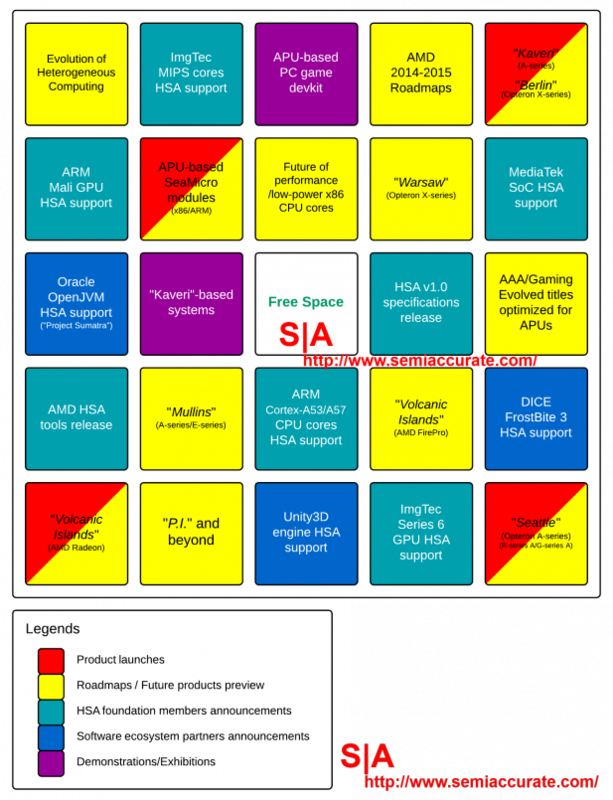 From the lineup above, we see the HSA Foundation is not just about AMD getting an ARM license, putting it on an APU design and find something to justify its move, instead the foundation is really giving their best shot at building an ecosystem around these 2.1 billion connected devices which are expected in 2016, spanning from servers, to home entertainment devices, to PCs and even mobile devices such as smartphones and tablets, benefiting the developers and ultimately the end-users. Even for those who aren’t too into “the future is HSA” kind of theme just yet, the AMD Developer Summit is still a good place for those who like developing on AMD APU systems, for those who like to follow the latest hardware trends, and for those who just loved good technologies.